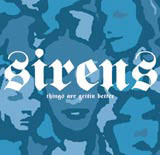 The Solution Group has created a marque for Kitchenware Records’ latest signing Sirens. The group is also working with the band on photography and print work. Has the bid committee missed a PR opportunity?